Our ART Black Horse Scanner help us to screen out stock that potentially have a big move soon, with just a click of a button, u can filter out the potential stock in less than a minute. We have a few counter on the list, one of them is SHC capital Asia, though this stock have been moving up since 2013 but the volume is not tradable, we see now there is sign of Big player coming in from our Smart money index. 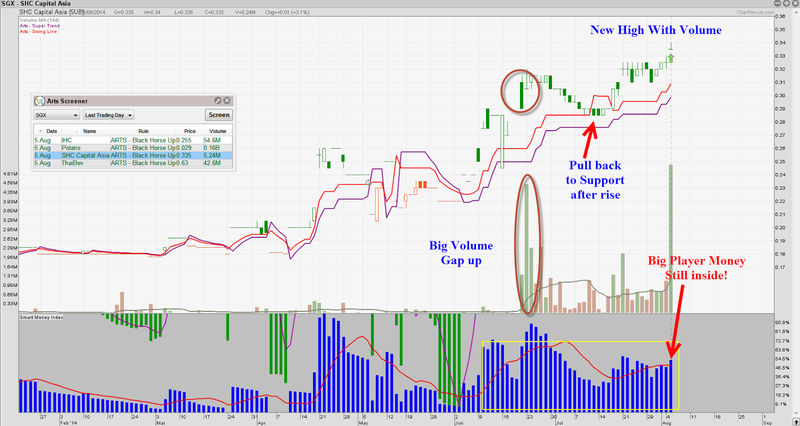 Currently the Support is at 0.30, this stock is more suitable for mid term trade. Lets see how far will this stock go! SHC Capital Asia Limited is an investment holding company. The Company’s principal activities include central planning and oversight, fund raising and capital allocation, and provision of management services to its subsidiaries. The Company’s insurance operations are conducted through its wholly owned subsidiary, SHC Insurance Pte Ltd. SHC Insurance Pte. Ltd. underwrites all classes of general insurance and provides a range of products for personal, corporate and commercial Lines. The main classes of insurance underwritten by the Company are motor; engineering related projects, such as contractor’s all risks/public liability, work injury compensation insurance and performance bonds; property insurance, such as fire and industrial all risks; marine cargo, and miscellaneous insurance, such as personal accident, travel insurance, theft and money. In August 2014, the Company disposed SHC Insurance Pte. Ltd.